The 85th Texas Legislature passed House Bill (HB) 22, establishing three domains for measuring the academic performance of districts and campuses: Student Achievement, School Progress, and Closing the Gaps. Beginning this year, districts will receive a rating of A, B, C, D, or F for overall performance, as well as for performance in each domain. Campuses will receive A–F ratings beginning in August 2019. 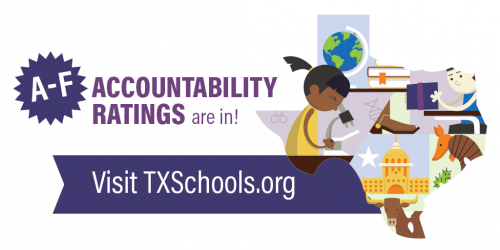 Visit TXschools.org today to look-up how Texas schools and districts performed.